Interprofessional education (IPE) and collaborative practice continue to gain momentum within the health sector. Recently, accreditors from multiple health professions have joined together to discuss their role and to set continuing education standards for IPE and guidance for interprofessional foundational education. And although models for IPE exist to guide the learning process from education to practice, there are few guides for the historic work of accreditors to promote interprofessional collaboration across education and practice. 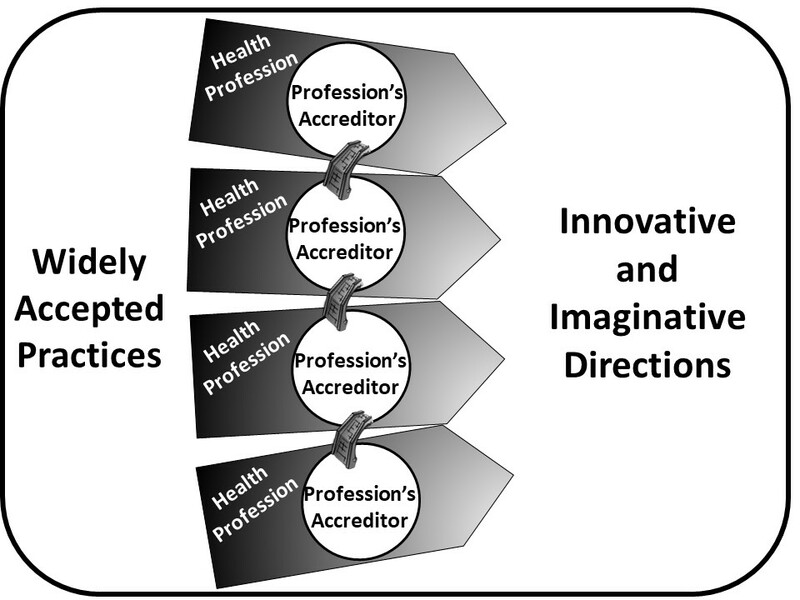 One example is a model presented when members of the Global Forum on Innovation in Health Professional Education of the National Academies of Sciences, Engineering, and Medicine came together in April 2016 with accreditors from different health professions to explore intersections of accreditation across the professions and throughout the continuum of health professions’ education . The continuum begins with entry into a field of study (i.e., foundational education) and extends through graduate training to lifelong continuing professional development. Susan Phillips, former Provost and Vice President for Academic Affairs and Vice President for Strategic Partnerships at the State University of New York at Albany, offered a model that illustrates an ideal trajectory from widely accepted clinical practice to new and innovative practices, with accreditors standing as facilitators at a particular point in their professions’ evolution (see Figure 1). Different health professions are displayed as arrows co-evolving in the same direction. Accrediting bodies are represented as white circles within each of the health professions. In the ideal collaborative environment, all the arrows (the evolution of the professions) ultimately overlap and the circles (the accreditors) all touch, demonstrating each profession’s need to educate and practice in an interprofessional manner, shoulder to shoulder with each other, within the larger government/regulatory context. As individual professions move toward being more innovative and imaginative, the locus of the circles will diverge, with early adopters shifting closer to the point of the arrow and late adopters adhering more closely to the widely accepted practices of the profession. As professions and their accreditors evolve, there will be natural differences across the professions in where along the spectrum a given accreditor might fall. This model shows the many opportunities for inter-accreditor and inter-profession conversations that can aid in moving toward enhanced collaboration of the professions. Figure 1 | Governmental and regulatory context of health professions and their accreditors | Source: NASEM, 2017. Note: Each arrow represents a different health profession, and the circles signify the accreditation body or bodies of each profession. In the ideal collaborative environment, all accrediting bodies are connected and related, as shown by the bridges between them. The box surrounding the arrows represents the larger governmental and regulatory context within which each profession and its accreditation bodies exist. turn needed collaborative practice competencies into educational plans? learn about emerging practice issues in each profession? address commonalities in health professions’ education that can then be reflected in common accreditation standards and processes? These questions largely focus on the role of educators in incorporating practice and accreditation standards into the educational process. However, the reverse proposition—that is, relating the opportunity for accreditors to promote interprofessional education and collaborative practice—should not be overlooked. Accreditors occupy a unique position, working within and across professions and health care delivery settings to promote interprofessional collaboration in education and care. Those who work within individual health professions and those accreditors working in different health care delivery domains should look to cross professional and delivery divides for more integrated approaches to the evaluation and regulation of education and clinical practice. To further expand on these concepts, five individuals from the education, practice, and accreditation communities came together to propose a a new model, which focuses on the collaborative needs in education and care delivery and is the focus of this paper. The purpose of this model is to show an ideal interprofessional accreditation system across health professions’ education and health care delivery. Although the authors recognize that accreditation of education and clinical practice have separate starting places, their common goal (as shown in Figure 2) is to build cooperation and collaboration among health professions’ educators, clinical systems of care, and their various accreditors to achieve the quadruple aim. Bodenheimer and Sinsky’s  expansion of the Triple Aim—improving the patient experience of care; improving the health of populations; and reducing the per capita cost of health care —also includes the goal of improving the work life of health care providers, including clinicians and staff. Figure 2 | Role of accreditors within and across health professions and health care delivery for fostering the quadruple aim | Source: Cox et al., “The Role of Accreditation in Achieving the Quadruple Aim,” National Academy of Medicine. 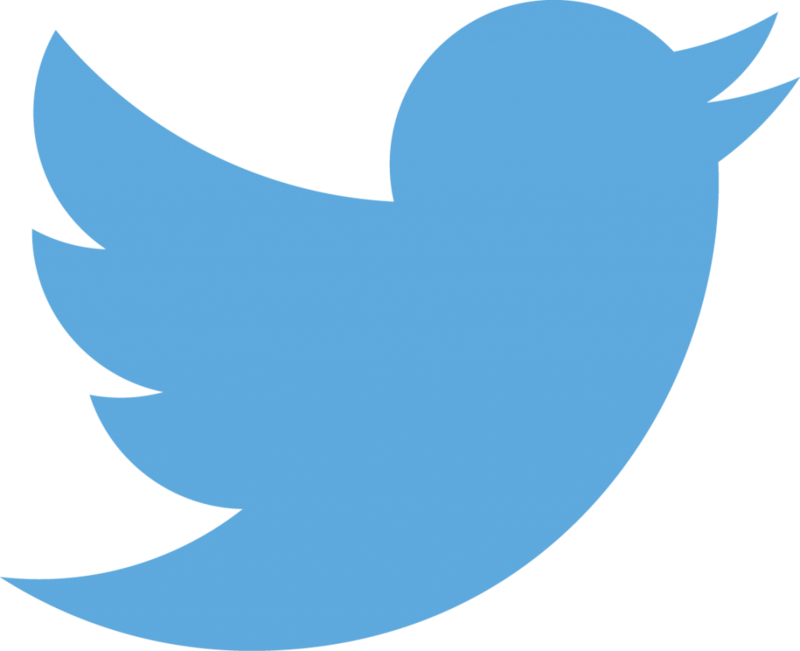 Note: This graphic was designed by James H. Jones, Chicago, Illinois. The left side of the model (Health Professions’ Education) is made up of three strands representing individual health professions and including their respective “educational continuums.” This continuum ranges from foundational education through graduate education to continuing professional development (CPD). The term foundational was carefully selected to acknowledge that entry-level education into the health professions differs across health professions and countries. The authors preferred continuing professional development over continuing education, because it involves more active modes of learning while conveying a desire for lifelong learning. The authors also recognize that not all health professions have a graduate-level component. For simplicity, only three professions are shown, but the number of professions acting together in any particular situation could be as low as two or could be much higher. What is important is the weaving together of professions with their accreditors across the educational continuum, culminating in an ideal interprofessional collaboration among and between educators and educational accreditors. The right side of the model (Health Care Delivery) is made up of five strands representing individual domains of the present delivery system. For simplicity only five such systems are shown, but additional systems—such as laboratory services, palliative care, rehabilitation, and others—each with their own independent accrediting body or bodies, exist. Like Phillips’s model in Figure 1, each profession’s and delivery system’s accrediting body (or bodies) has the potential for a full range of innovation, with early adopters represented as dots closer to the center and later adopters farther away from the center. 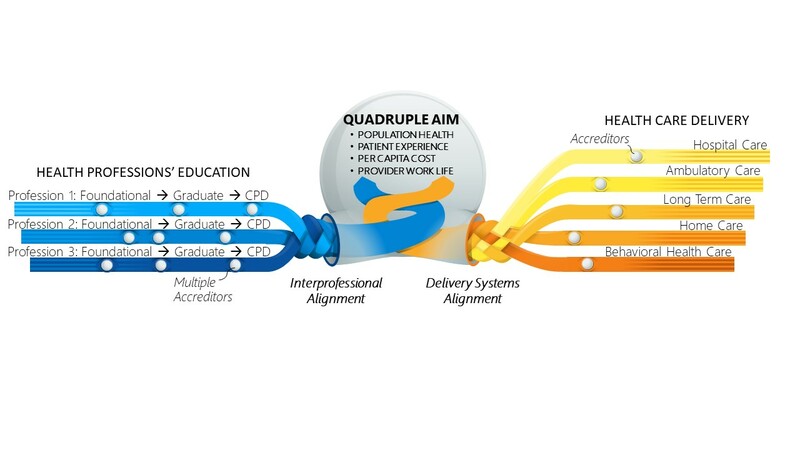 The overall and joint goal of the educational, delivery, and regulatory systems (represented by the quadruple aimin the center of the figure) is collaboration among and across the health professions and health delivery systems, as reflected in the various accreditation standards and processes. This cooperation is represented by intertwining strands (braids or weaves) at relevant points in the figure. It should be noted that there are different versions of the quadruple aim for health. A 2015 IOM report delineates measures for progress toward the quadruple aim of healthy people and communities, high-quality care, affordable care, and engaged people . If standardization or harmonization within the educational and health care delivery systems were more focused on the increasingly recognized benefits of team-based care, then the future development of interprofessional collaborative practice would greatly benefit. However, unlike educational accreditation, it may be more difficult to harmonize the work of the various health care delivery accreditors, given that they tend to use their standards as market differentiators. 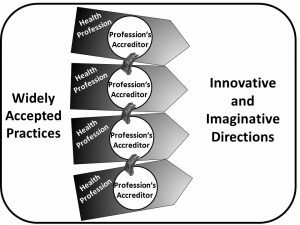 One of the challenges for educators and health care providers alike is judging where they reside along the accreditation innovation continuum. Both must consider the effect of ongoing educational reform, ever accelerating practice redesign, new practitioner roles, and new venues of practice, as well as the changing roles of patients, families, and communities. However, the ultimate goal is to collaborate across and between professions and delivery systems to address emerging learning and practice issues. How best to incorporate care quality and patient safety, the social determinants of health, and clinical workforce resilience and burnout are recent issues of particular pertinence that need to be reflected in educational and health delivery accreditation standards and processes. In the United States, the seminal work of the Interprofessional Education Collaborative (IPEC), initially representing higher education in allopathic and osteopathic medicine, dentistry, nursing, pharmacy, and public health, brought forth in 2011 important agreement on interprofessional education definitions and core competencies for interprofessional collaborative practice. Their work has guided curricula development across health professions schools (to learn more about IPEC, visit https://www.ipecollaborative.org). In 2012, the National Center for Interprofessional Practice and Education (NEXUS) was founded—through public and private funding—to support “evaluation, research, data and evidence that ignites the field of interprofessional practice and education and leads to better care, added value and healthier communities” . Subsequently, the Association of Specialized and Professional Accreditors hosted several forums on interprofessional education involving IPEC and NEXUS leaders . In 2014, the Health Professions Accreditors Collaborative (HPAC) was formed, in part to work collaboratively in providing harmonized guidance and expectations for foundational health professional education across the six IPEC professions. Recently, important IPEC and HPAC growth has occurred. IPEC now has 20 health profession members . HPAC has recently expanded to include 23 health professional accrediting bodies that are meeting with NEXUS leadership to work toward harmonized standards and the opportunity to facilitate the accreditation of interprofessional education . Of note, the continuing education accrediting bodies for medicine, nursing, and pharmacy in the United States have formed a partnership to offer a unified review process for the three professions. This joint accreditation process promotes interprofessional continuing education activities specifically designed to improve interprofessional collaborative practice . In addition, a concerted effort is under way to go beyond cross-professional dialogue alone to encouraging better alignment between education and practice through workshops and meetings of the Global Forum on Innovation in Health Professional Education as well as demonstration projects of governmental organizations such as the US Health Resources and Service Administration and US Department of Veterans Affairs [10,11,12]. Accreditation of health professions’ education varies greatly by profession and by country. In lower-income countries, there is often no accreditation system, whereas health professions in higher-income countries may have an overabundance of sometimes poorly coordinated accrediting bodies. Both extremes present challenges. Countries without accreditation cannot ensure that education meets acceptable levels of quality and that the competency of their graduates is reliable. 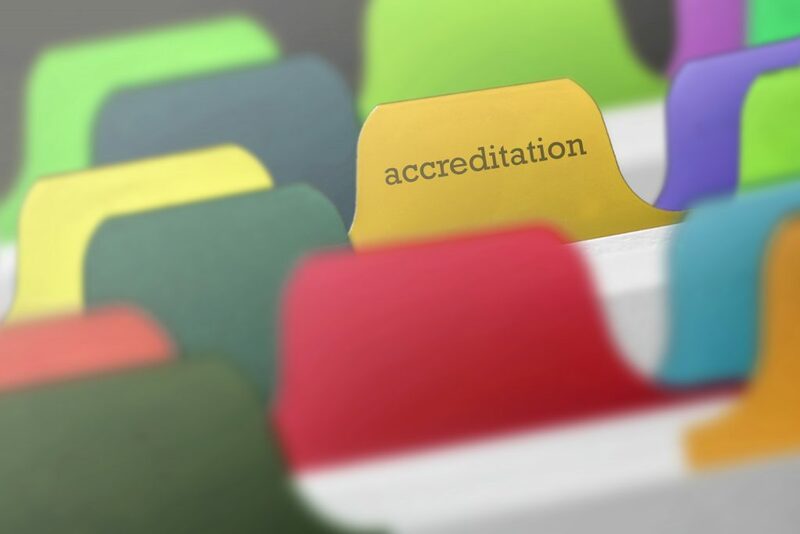 The other extreme, involving multiple and generally independent accrediting bodies, can be time consuming and costly because of separate policies, procedures, standards, measures, and documentation requirements. Inherent risks associated with excessive regulation of institutions having to function in low-resource environments should also be recognized. For example, the post-Flexner era in the United States  led to numerous medical schools for women and African Americans being closed, and the end of training in small rural schools in lieu of larger, more centralized universities . The drive for universal health coverage in low- and middle-income countries has led many nations to develop national accreditation systems as a strategy for quality enhancement [15,16]. The Joint Learning Network (JLN) for Universal Health Coverage is a consortium of practitioners and policy makers from nine countries in Africa and Asia who share knowledge and experience for joint problem solving in how to provide high-quality coverage to many of the world’s poorest people. Accreditation is now part of health care quality improvement goals within JLN schemes [15, 17]. There appears to be an increasing desire to integrate education and delivery systems to better protect the health of the public [18,19,20,21,22]. Given that regulation and accreditation are in place to advance quality and protect the public’s health, it is natural for regulators and accreditors to want to move toward greater alignment within and across systems, regardless of their current level of harmonization. The model presented in Figure 2 may satisfy both current needs and the aspirational desires of professional organizations and governments to better integrate academia with practice. Creating feedback loops that engage both education and practice across the health professions brings everyone into the same conversation. Including the accreditors promotes a unified goal of monitoring and improving progress toward the quadruple aim. These activities are critical for further strengthening links between education and practice and between their respective accrediting bodies (e.g., HPAC and the Joint Commission). As noted in the Institute of Medicine (IOM)  report, Measuring the Impact of Interprofessional Education on Collaborative Practice and Patient Outcomes, collaboration between organizations responsible for health professions’ education and health care delivery allows for more robust evaluations of interprofessional interventions and investments. There is a growing recognition of the need for shared professional values and clinical competencies that are moving the health professions toward greater collaboration. 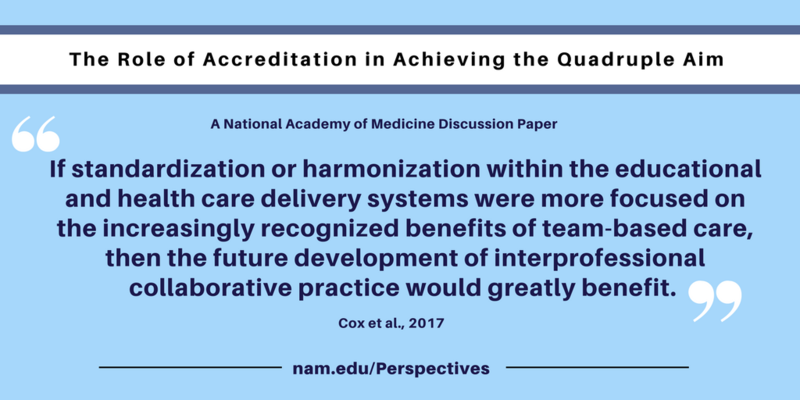 Concurrent with this shift toward greater interprofessional education and work is the acknowledgment that collaboration and harmonization among accreditors could facilitate a common goal within all the health professions of achieving the Quadruple Aim. To initiate a structured conversation on next steps, the authors of this paper propose the model in Figure 2. This model can be used by accreditors for developing a timeline of purposeful collaboration to begin agreeing upon similar definitions, expectations, and harmonized standards that can be used to evaluate interprofessional efforts. Monitoring collaborations will be key to demonstrating progress. Although discussions are already under way through HPAC’s expanded network of the health professions’ accrediting bodies, they are just in the initial stages. The authors encourage those members and other accreditors not yet part of HPAC to look to the model for guidance on working together. Those in the health professions from education to practice can similarly employ the model for inspiration to improve collaboration and communication among health professions and between education and practice. It is through this combined effort of the health professions and the accreditors that all parties can start to share a common vision. This shared vision will continue a movement toward better health for populations and providers, improved care for patients, and more efficient use of funds. National Academies of Sciences, Engineering, and Medicine (NASEM). 2017. Exploring the role of accreditation in enhancing quality and innovation in health professions education: Proceedings of a workshop. Washington, DC: National Academies Press. doi: 10.17226/23636. Bodenheimer T., and C. Sinsky. 2014. From triple to quadruple aim: Care of the patient requires care of the provider. Annals of Family Medicine 12(6):573-576. Institute for Healthcare Improvement. 2017. http://www.ihi.org/Engage/Initiatives/TripleAim/Pages/default.aspx (accessed on September 13, 2017). 2015b. Vital signs: core metrics for health and health care progress. Washington, DC: National Academies Press. Brandt, B., M. N. Lutfiyya, J. A. King, and C. Chioreso. 2014. A scoping review of interprofessional collaborative practice and education using the lens of the Triple Aim. Journal of Interprofessional Care 28(5):393-399. Association of Specialized and Professional Accreditors (ASPA). 2016. http://www.aspa-usa.org/ (accessed July 29, 2017). Interprofessional Education Collaborative (IPEC). 2017. https://www.ipecollaborative.org/about-ipec.html (accessed July 29, 2017). National Center (The National Center for Interprofessional Practice and Education). 2017. https://nexusipe.org/informing/about-national-center/news/health-professions-accreditors-collaborative-welcomes-17-new (accessed July 29, 2017). Joint Accreditation (The Joint Accreditation for Interprofessional Continuing Education). 2013. http://jointaccreditation.org/ (accessed July 29, 2013). IHPE Forum (Global Forum on Innovation in Health Professional Education). 2017. http://nationalacademies.org/HMD/Activities/Global/InnovationHealthProfEducation.aspx (accessed July 29, 2017). Health Resources and Services Administration (HRSA): Maternal and Child Health Bureau. https://mchb.hrsa.gov/training/hi-inter-2015.asp (accessed June 15, 2017). Gilman, S. C., D. A. Chokshi, J. L. Bowen, K. W. Rugen, and M. Cox. 2014. Connecting the dots: Interprofessional health education and delivery system redesign at the Veterans Health Administration. Academic Medicine 89(8):1113-1116. Johnston, G. A. 1984. The Flexner report and black medical schools. Journal of the National Medical Association 76(3):223-225. Page, D., and A. Baranchuk. 2010. The Flexner report: 100 years later. International Journal of Medical Education 1:74-75. Mate, K. S., A. L. Rooney, A. Supachutikul, and G. Gyani. 2014. Accreditation as a path to achieving universal quality health coverage. Globalization and Health 10(1):68. Smits, H., A. Supachutikul, and K. S. Mate. 2014. Hospital accreditation: Lessons from low- and middle-income countries. Globalization and Health 10:65. Joint Learning Network. n.d. JLN @ 5: Practitioner-to-practitioner learning helps countries move toward universal health coverage. Washington, DC: Joint Learning Network. Kleinpell, R. M., M. Faut-Callahan, E. Carlson, J. Llewellyn, and M. Dreher. 2016. Evolving the practitioner-teacher role to enhance practice-academic partnerships: A literature review. Journal of Clinical Nursing 25(5-6):708-714. Ricketts, T. C., and E. P. Fraher. 2013. Reconfiguring health workforce policy so that education, training, and actual delivery of care are closely connected. Health Affairs 32(11):1874-1880. National Health Service (NHS) England. Academic Health Science Networks. https://www.england.nhs.uk/ourwork/part-rel/ahsn/ (accessed July 27, 2017). Institute of Medicine (IOM). 2015a. Measuring the impact of interprofessional education on collaborative practice and patient outcomes. Washington, DC: National Academies Press. Frenk, J., L. Chen, Z. Bhutta , J. Cohen, N. Crisp, T. Evans, H. Fineberg, et al. 2010. Health professionals for a new century: Transforming education to strengthen health systems in an interdependent world. The Lancet 376(9756): 1923-1958. Two of the authors are members of the Global Forum on Innovation in Health Professional Education at the National Academies of Sciences, Engineering, and Medicine (nationalacademies.org/ihpeglobalforum): Malcolm Cox, MD, Adjunct Professor, Perelman School of Medicine, University of Pennsylvania; and Miguel Paniagua, MD, FACP, Medical Advisor, National Board of Medical Examiners. Patricia Cuff, MS, MPH, directs the Global Forum on Innovation in Health Professional Education. Susan Phillips, PhD, University at Albany, State University of New York and Former Chair, Committee on Accreditation, American Psychological Association; and Peter H. Vlasses, PharmD, DSc (Hon), FCCP, Executive Director, Accreditation Council for Pharmacy Education, presented at the Forum-hosted workshop titled “The Role of Accreditation in Enhancing Quality and Innovation in Health Professions Education.” Ann Scott Blouin, RN, PhD, FACHE, is Executive Vice President, Customer Relations, the Joint Commission. The authors are grateful for the insights and assistance of Neil Harvison, Chief Officer, Academic and Scientific Affairs at the American Occupational Therapy Association; Eric Holmboe, Senior Vice President, Accreditation Council for Graduate Medical Education; and Brenda Zierler, Co-Director, Center for Health Sciences Interprofessional Education, Practice and Research at the University of Washington. Special thanks go to James H. Jones, Chicago, Illinois, for his graphic design of Figure 2.